The jail book uncovered during the clean-up at Keokuk's City Hall. 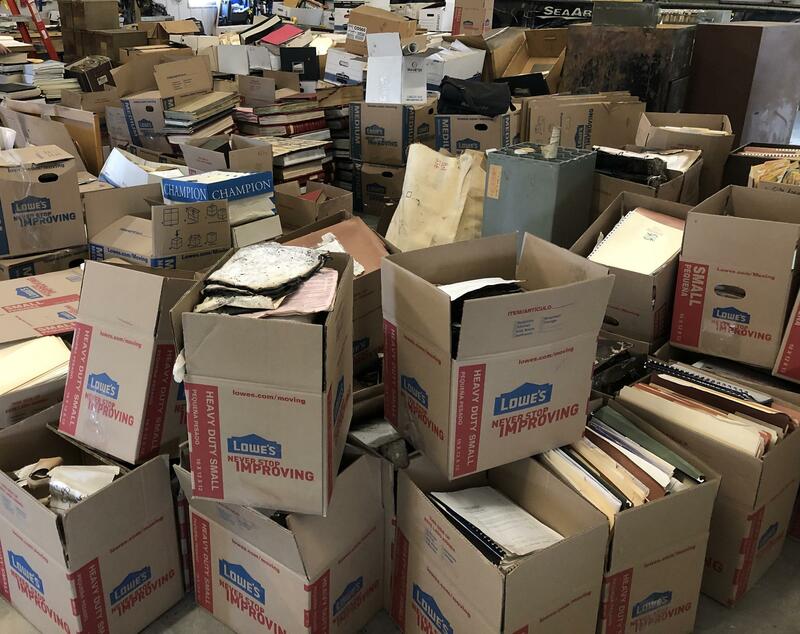 Crews have spent hours removing hundreds of thousands of old documents from Keokuk’s City Hall following the fire that severely damaged the two-story brick building. That process is leading to the discovery of some forgotten pieces of city history. Mayor Tom Richardson said the city’s insurance provider is paying for the city to digitize its records for future preservation. He said if paper documents must be kept, efforts are being made to clean them up after receiving smoke and water damage. Just one of several location where Keokuk is storing documents following a fire at City Hall in February. Richardson said most of the documents removed from City Hall have been pretty run-of-the mill—but not all of them. He said one of the most interesting finds was a police log from the 1940’s. Richardson said another interesting item was an original sketch on linen of the city’s railroad bridge across the river. He said it was in a simple black cylinder, so no one would have known what was inside without opening it. Richardson said the city has also found minutes from city council meetings held in the 1800’s and employment records from the 1920’s. He said the goal is to eventually display the more unique items at the Keokuk Public Library. The city's insurance provider does not consider City Hall to be a total loss. So the city will have the option to return to the building after a full renovation or to move to a new location. The maximum the city would receive from the insurance company if it moves off-site is about $1.5-million. The insurance settlement for the city of Keokuk following last month's fire at City Hall will not be quite as high as some anticipated. That's because the two-story brick building at 415 Blondeau Street is not considered a "total loss." City Administrator Cole O’Donnell said Keokuk will ramp up discussions about the future of City Hall as soon as it receives the financial settlement from its insurance provider following last week's fire. He is confident the discussions will not include two particular properties: the former Roquette America office building and the entertainment barge.